The project is called Rorsketch. The first part of the name comes from the Rorshach test, a psychological test in which people’s perceptions of inkblots are recorded and subsequently analyzed. While the Rorschach is used to examine a subject’s personality characteristics and emotional functioning, I intended for Rorsketch as a way for us to be mindful of the other things―the potential―that we can see in ordinary objects. This is a project of imagination. I use it as a reminder to myself that things are not always what they seem, and that the world is replete with possibility. Inspiration can be mined from anywhere, especially from things we often take for granted or ignore. This is also a project of perception. An object can mean a wide variety of things to the same person on different days, and also to different people. Seeing is different from interpreting. It is always worthwhile to take a second look. Each post consists of at least two photographs; the original and the one (or ones) that has been drawn over. There might be more than one interpretation per image. Clouds are a particular favorite of mine because they are untouchable ephemera that morph into different shapes, coalesce, separate, and disappear within a short span of time. Their forms may be abstract, but observing them for some time can trigger shapes that we can recognize. Whatever figures I imagine in them vanish as quickly as I see them; one formless mass can recall many familiar shapes. When I show these photo-sketches to others, it strikes me how differently we see these shapes and how one thing can trigger a variety of metaphors in different people. In a study done by University of Michigan researchers in 2005, they found key differences in visual perception between the West and the East. Shown a photograph, North American students of European background paid more attention to the object in the foreground of a scene, while students from China spent more time studying the background and taking in the whole scene, according to University of Michigan researchers. “They literally are seeing the world differently,” said Nisbett, who believes the differences are cultural. Sample pictures presented in the study. Thirty-six pictures with a single foregrounded object (animals or nonliving entities) on realistic backgrounds were presented to participants. I would say that, in addition to culture, there are other factors that can contribute to people having a bias to what they see, such as profession and hobbies. 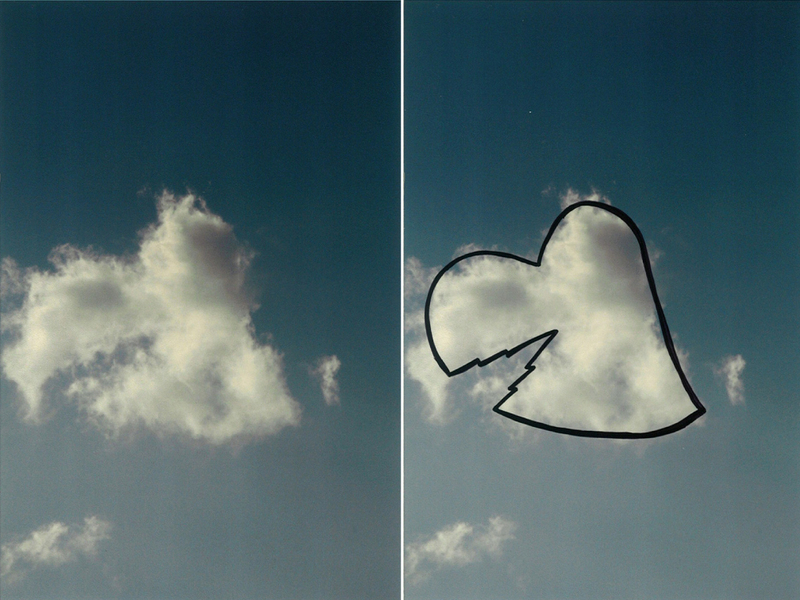 When I ask many people to interpret one cloud photograph, I see a variety of answers. I do relate to the results of the Michigan study. Being raised in Asia, I tend to see the abstract form as a whole, while my American and European friends see one focal point and may ignore the periphery. For Rorsketch, I’m not as concerned with the geographical differences; rather, I am primarily interested in the multiplicity of people’s interpretations. While I do profile participants based on the country they were raised in, their professions and their hobbies, Rorsketch is an illustration project that aims to visually capture what people imagine from abstract forms. Visit the project site as well as this blog, that will regularly keep track of them. An artist may have a unique way of seeing things, but there are objects that are (almost) universally the same for all. This is why we have icons. Most people will agree that a stick figure is a person. A horizontal line with two straight ones attached to its right end and oriented diagonally is an arrow pointing to the right. Icons lead to having universal standards that are agreed upon by all. They lead us to having a learned and automatic understanding of symbols, making it easier for us to navigate the world. In Rorsketch, I was struck by how 4 out of 5 people (including myself) interpreted this as a dolphin. 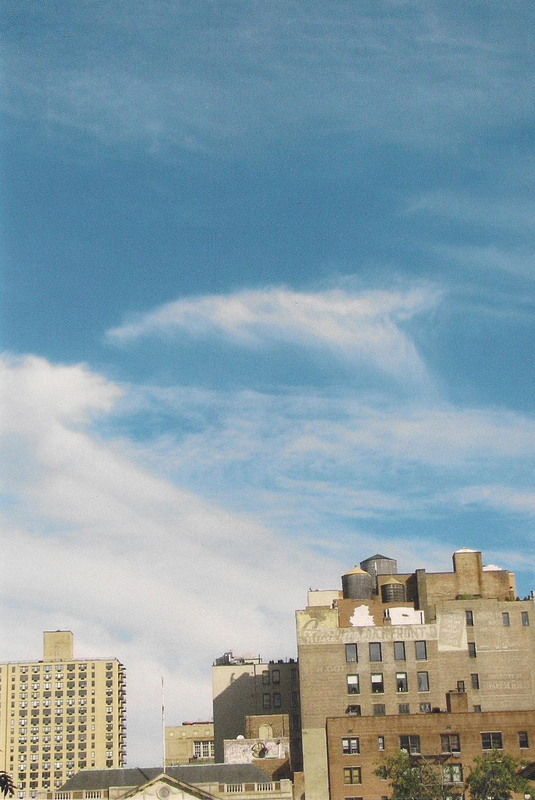 Cloud 31 - Do you see the dolphin? Could it be we have been exposed to enough dolphin shows, movies, cartoons, logos and other related visual media, that the sight of a fin sloping at an angle automatically recalls our memory of this marine mammal? Perhaps if the fin were more angular and perpendicular to the base of the photograph, people may think it were a shark. Our collective perceptions contribute to myths and urban legends that persist through time. Sailors report shapes that recall women with tails of fish, and voila, the legend of mermaids is still around. The stars that form Ursa Major still recall the shape of a Big Bear, and so that nickname persists and makes it easy for us to find it at night. To document these visual perceptions, drawing has been the most logical way, as well as the easiest. Why drawing? While I use photography to document the form, my camera does not capture my imagination; I need my own hand to do that. A big part of me is an illustrator. I like to doodle. If I like you enough, I will likely doodle you. I draw to remember things—the act of committing a scene to paper, line by line, allows me to render it permanent in my mind more than photography ever could (though that helps, too, and I also like taking photographs.) I also like getting other people to draw. Again, why drawing? In an age of apps, taps, and the instantaneous, of getting software to do everything for you, what is the point of turning to the slow, archaic, primitive act of using (gasp!) paper and pen? I think the reason is clarity. To draw is to make clear what you mean. If I can’t draw what I think, the idea is probably still convoluted in my head. Drawing is a way of clearly embodying an abstraction using simple points and lines. To draw is to communicate to another person what I am thinking. And on that note, it is an agency that leads to agreement. “Here is what I see. Do you agree?” or “Here is what I see. Are you seeing the same thing?” It’s different from text because language is cultural and the same word can mean different things. Drawing can lead to revolutions. I love going back to the history of neuroscience. While Purkinje found the first neurons in 1837, thanks to advances in microscopy, this was not enough to debunk the prevailing notion of the time, which is that the brain is composed of fibrous tissue and not cells. It was a debate between the reticularists (the researchers who believed that the nervous system consisted of a network of tissue, or reticulum), and the neuronists (the one who believed that it consistent of discrete entities, or cells). In 1873, Camilo Golgi discovered a new way of staining tissue and showed clear pictures of the brain. Santiago Ramon y Cajal used Golgi’s staining methods to clearly show the neurons in the cerebral cortex. While they refuted each other—Golgi maintained that the brain is composed of fibrous tissue while Cajal declared that it was composed of cells—they shared the Nobel Prize in 1906. 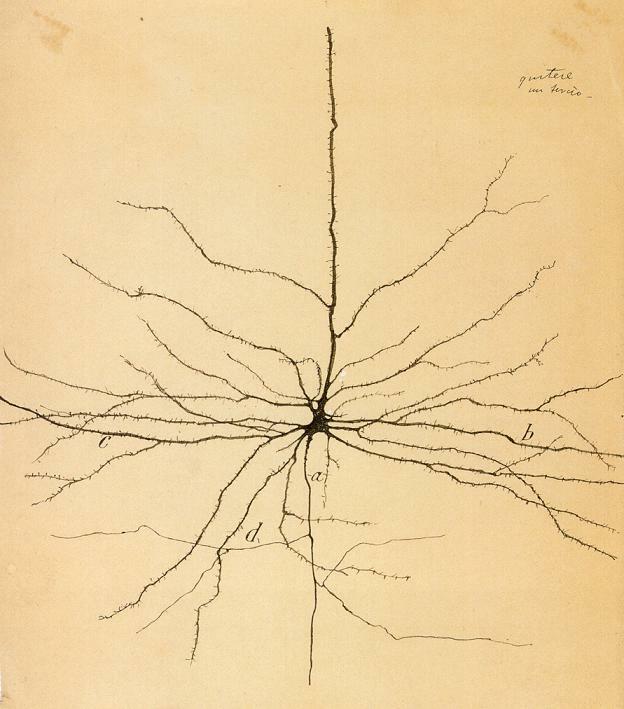 I find it hard to imagine neuroscience today without Cajal’s illustrations. Each time a modern neuroscientist tracks a brain cell using advanced time-lapse imaging, he hearkens back to the 19th century when Cajal and his fellow neuronists imagined the brain as composed of these individual units, to the time when Cajal sat down with a mere pencil and paper to communicate his view of the world of the brain. It is noteworthy that up until the 1840s, decades before the neuronists’ time, phrenology was quite popular. Thank goodness Cajal could draw.